Another Galaxy smartphone has exploded and injured its owner. Bupyeong Fire Station in Incheon on Sunday said a 55-year-old man reported the previous day that his smartphone battery blew up in the pocket of his pants. 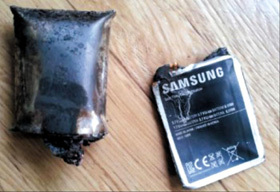 The man said he was carrying a Samsung Galaxy Note along with a spare battery in his pocket before they suddenly blew up. He is being treated for second-degree burns to his right thigh. In March last year, a schoolboy in Gwangju suffered an injury when his Galaxy S2 smartphone exploded in his trouser pocket. The latest accident has not been reported to Samsung yet, a company spokesman said. "Lithium ion batteries can catch fire due to external pressure or sudden changes in temperature, so we're trying to understand what really happened," the spokesman added. Pre-Sales of Pricey Galaxy S4 to Start in U.S.